This book needs no introduction for a long time comic book fan. If ever there was one book that changed the course of publishing and comic books, it is this. Action Comics No. 1 was the tipping point in the comic book world. Whoever knew that this little piece of publishing history by National Allied Publications would become one of the most sought after, the most expensive and the most valuable comic book ever to be in existence today. Action Comics may be known for Superman today, but back then it was a monthly anthology of different stories. Superman was introduced in this issue. Along with Chuck Dawson, Zatara Master Magician and other stories. 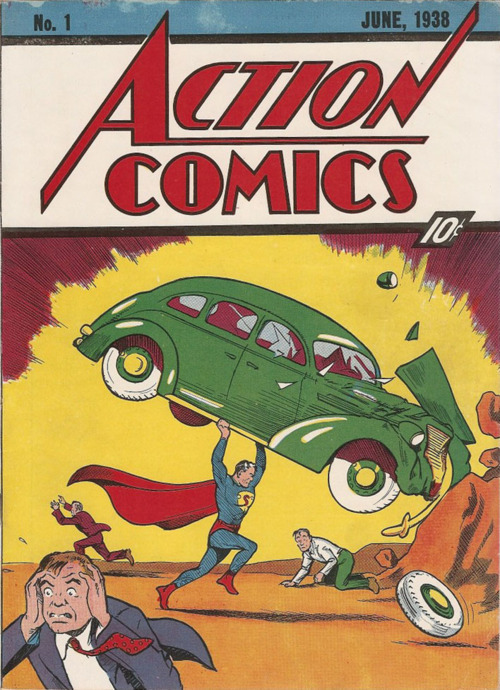 The cover features the iconic image featuring Superman hauling a, what seems to be a late 1930’s Chevrolet. The book starts of with Superman. We are introduced to the character with a short, one page introduction (abundant with comical continuity and writing gaffes), along with a almost funny to us scientific explanation of Superman’s amazing strength. Oh, he cannot fly. He can just jump off buildings. There is no mention of Krypton and no mention of his parents. In my opinion, it is a very concise and brief introduction to the man of steel with all the superpowers you can imagine. Except flying. Quite frankly, the art is nothing to write about. Its very old school. It seems hurried and rough. But then again, this was the best they could do back in the day. And we are talking about the 1930s! Some panels do stand out. Like the one where Superman bursts into the Governors house by breaking the door, and when the bullet bounces off Superman’s chest when the Governor’s butler shoots. Oh, and did I mention that Clark Kent works at ‘The Daily Star’ and not ‘The Daily Planet’. My favourite moment in the whole book is when the editor asks Clarke, “Have you ever heard of Superman?” and Clarke gasps in disbelief. The expressions are clear and the lettering is decent too. Another panel that stands out is when Superman is stopping a wife beater. The husband trembles when Superman says “You are going to get a lesson you will NEVER forget”. In the very next panel, Clark is seen asking Lois Lane on a date and Lois agrees! The story is a bit wayward and there are mistakes. But there is a charm to it. Superman doesn’t speak much. Nor do any other characters. Each and every panel is numbered. As I said before, the work seems rushed and its evident. The writing is strictly ok. Characters keep jumping in and out and so do situations. Its like Clarke and Superman had one long bad day. Its like watching a badly edited Bollywood movie. But this book is not about that, its about how this one character, goes on to become one of the greatest comic book heroes this world has seen. The future of Jerry and Joe was sealed. In an almost prophetic last panel, the words read “And so begins the startling adventures of the most sensational strip character of all time: SUPERMAN!”. They sure did. There are other stories in this book too. Chuck Dawson is boring. Yeah, 5 pages of boredom. I pretty much got bored reading the introduction itself. Then there is Zatara The Master Magician. Zatara and Tong are solving the mystery of the Freight train robberies and confront their arch enemy, The tigress. This I would say was a much better written stories. It wasn’t rushed like Superman. It has its stupid moments, like when Zatara somehow magically makes appear a first aid kid on top of a moving freight train. Also, do note that when Zatara casts his spell, they aren’t gibberish. It’s just words written backwards. You can read them from right to left. Sticky Mitt Stimson was kind of funny. Reminded me of Mr. Bean. The Adventures of Marco Polo is the only non-fiction story in this book and is nicely illustrated. Pep Morgan is a Boxing story. It was uninteresting. Atleast for me. Scoop Scanlion was ok too. A journalist gets the scoop of a jewel thief being captured and.. (Yawn). Finally, there is Tex Thomson. How he lets go of an opportunity to be an oil baron and dons the Mr. America costume. Overall, does it entertain? Yes. People of the 1930s mainly. For the rest of us, its charming. Its just a simple comic book trying to tell many stories at once. And creating history while doing so.